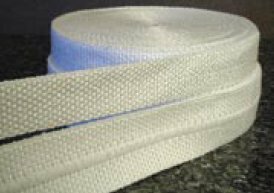 This high temperature, heat resistant and thermal insulating PTFE coated tape offers the advantage of a non-asbestos material with a higher temperature range and with excellent resistance to almost all solvents, caustics and acids. This high temperature PTFE coated tape is used as a gasket and seal material and also as an insulation material for wire, cable, hose, tube and pipe carrying high or low temperature liquids or gases. Available in 1/16", 1/8" and 3/16" thickness and 0.5" to 6" widths. The PTFE is applied to the sleeve by dipping the sleeve through an immersion tank of liquid PTFE dispersion. The sleeve is then air dried as it leaves the dip tank. The result is a PTFE coating on the sleeve which is soft, robust and flexible; however, it can be abrasively removed from the sleeve with aggressive fingernail scraping, resulting in a thinner and thinner layer of ptfe remaining with each pass. The PTFE also causes the yarns to be sealed and the small gaps between the yarns filled, resulting in an almost air-tight / liquid-tight sleeve wall.